With the fall elections behind them and 2011 quickly approaching, newly-elected Republican governors and state legislators are facing a torrent of federal mandates to implement the new health overhaul law – a law which many of them vociferously campaigned against. The federal government is demanding they spend precious time in their upcoming legislative sessions to set up massive new bureaucracies in anticipation of spending billions of dollars to implement ObamaCare. In a recent meeting of the Republican Governors Association in San Diego, they agreed they must protect their states from being swamped by these federal demands. Gov. Tim Pawlenty of Minnesota has prohibited state officials from requesting any federal funds or taking any actions to implement the law without clearing it first with him. Wisconsin Gov-elect Scott Walker said he wants his state to freeze all efforts to put the law into effect until he takes office in January. Walker plans to join 20 other states in the Florida lawsuit against the health overhaul law and says he will do as little as possible to comply — but just enough to keep federal officials out. * No mandates: At least 42 states have either passed or introduced Freedom of Choice legislation or amendments designed to protect their citizens from the federal law’s onerous “individual mandate.” Starting in 2014, everyone will be required to have government-approved health insurance or pay a fine. The mandate is the subject of the major court challenges as an unconstitutional intrusion of federal power into individual freedom. * Hearings: State officials also are planning hundreds of hearings to learn from business people and entrepreneurs the effect on job creation and health costs of the law’s new taxes and mandates. Many companies are contemplating dropping health insurance, and the law’s mandates are deterring job creation. * Block grants: Medicaid is a juggernaut that is already gobbling up resources for everything from public safety to education to transportation and it must expand under Obamacare. Governors have been pleading for years for more flexibility so they can gain control over spending and be freed from federal rules. Some, like Texas Gov. Rick Perry, are threatening to pull out of Medicaid altogether. * Exchanges: The federal government is demanding that state legislators get to work creating Health Insurance Exchanges that will be the mechanism for strict regulation of health insurance and delivery of new subsidies in 2014. Many states are ready to push back against the micromanagement of a Massachusetts-style exchange and instead are looking at the much more lightly-regulated Utah Health Exchange model. Utah’s exchange is run by fewer than five state employees and is primarily a web-portal to facilitate the purchase of pre-tax health insurance for individuals and small businesses. It is a model many states were considering even before the federal law passed. * Don’t follow Massachusetts: States are looking at the experience of Massachusetts as a harbinger of things to come with the federal law. Massachusetts enacted a law under former Gov. Mitt Romney in 2006, creating an exchange and mandating that its citizens purchase health insurance or pay a fine. The law did nothing to lower health costs – the biggest concern of families and small businesses. Government control over the lives of citizens is becoming more onerous by the day. The Commonwealth’s version of a health exchange “has turned into a legal pit bull by aggressively going after a growing number of Bay Staters who say they can’t afford the mandated insurance – or the penalties imposed for not having it,” according to the Boston Herald. This is a harbinger of things to come with the new federal law. Stay tuned: The next big pushback against ObamaCare is going to come from the states exerting more of their muscle against this hugely unpopular law. 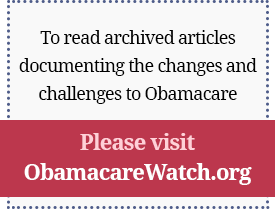 Published on the Health Reform Report, Dec. 1, 2010.